You should take a look at the FTP Voyager Versions page for a description of the features that are available in each version. The FTP Voyager user interface is uncluttered, easy to understand, and allows you to customize which panes you want to see displayed. 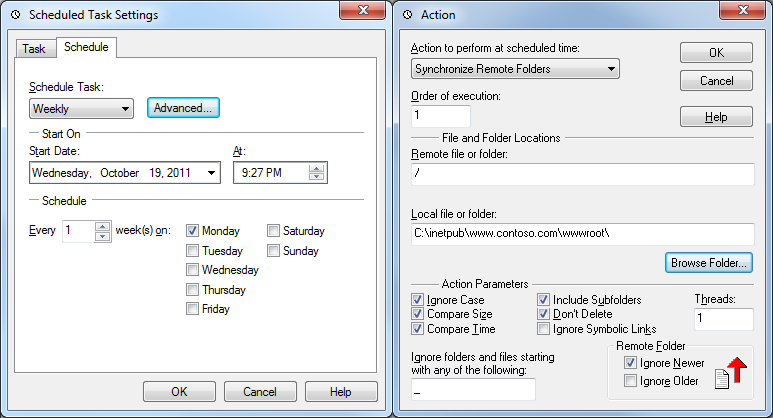 FTP Voyager doesn't have a command-line interface, but it has web browser integration; and it has a really cool scheduler, which allows you to configure FTP jobs to run at scheduled times. 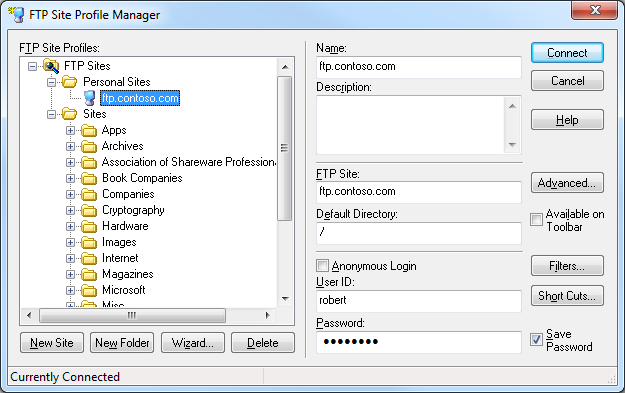 FTP Voyager also supports sending custom FTP commands, and it has an extensibility interface for creating add-ons. 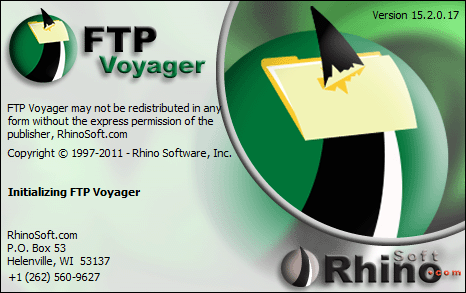 I didn't experiment with creating any add-ons, but you can find details about creating your own add-ons through RhinoSoft's FTP Voyager Add-Ons page. 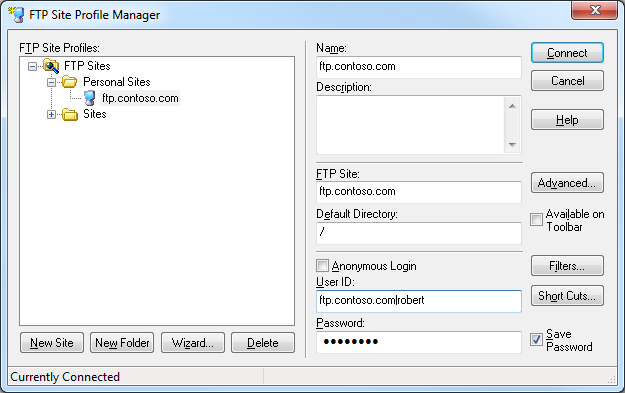 FTP connections are created and edited through FTP Voyager's Site Profile Manager, which is comparable to the site management features that I have found in many of the better GUI-based FTP clients. That concludes my summary for some of the general features - so now we'll take a look at the FTP7-specific features that I've discussed in my other FTP client blog posts. 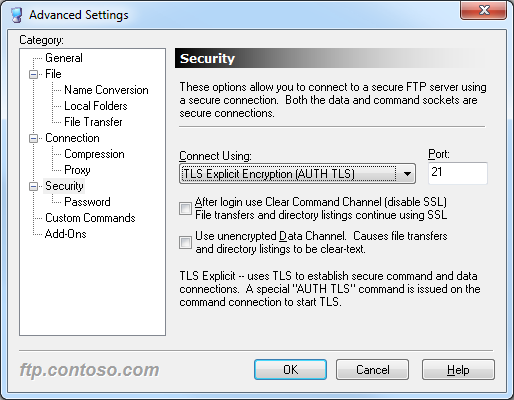 If you enable SSL in FTP7 and you assign the FTP site to port 990, you are using Implicit FTPS. If you enable SSL in FTP7 and you assign the FTP site to any port other than port 990, you are using Explicit FTPS. 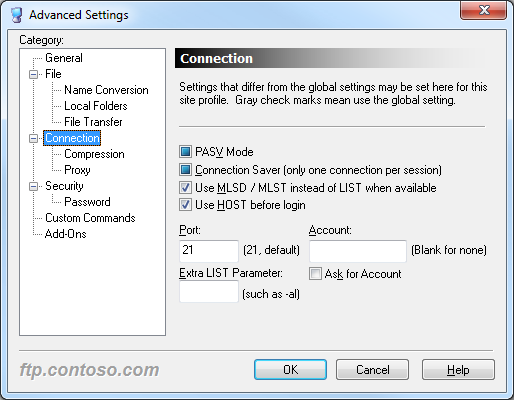 To configure the security options for a connection in FTP Voyager, you need to open the Advanced Settings dialog for the connection in FTP Voyager's Site Profile Manager. 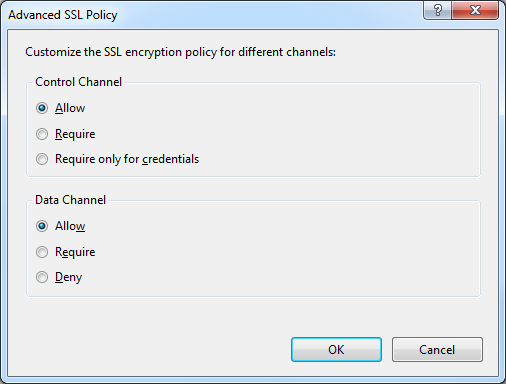 The additional security options in FTP Voyager's Security Options allow you to configure the SSL environment to match FTP7's Advanced SSL Policy settings. Note: I was able to use FTP Voyager's FTPS features with FTP7's virtual host names, but I should mention that I had to configure a Global Listener FTP Site in order to get that to work. 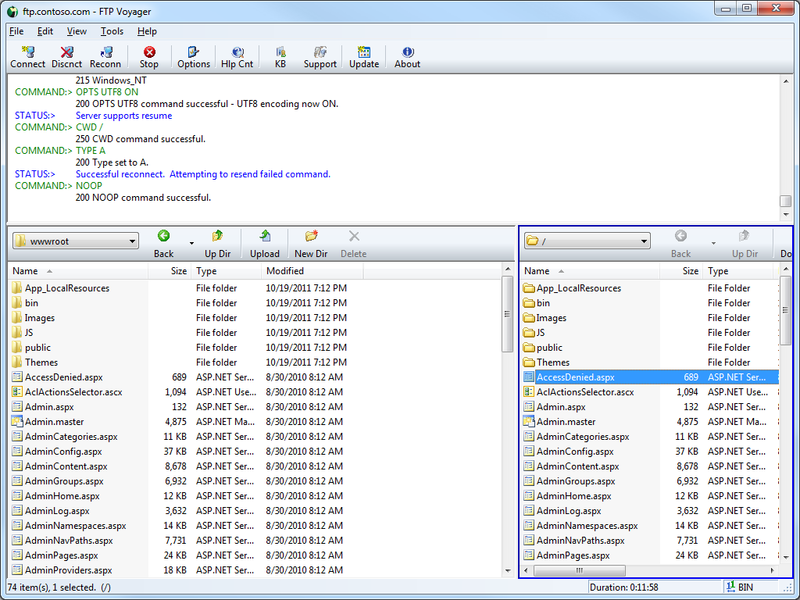 FTP Voyager has built-in for the HOST command, so you can use true FTP host names when using FTP Voyager to connect to FTP7 sites that are configured with host names. This feature is enabled by default, but if you needed to disable it for some reason, that feature can be accessed through FTP Voyager's Advanced Settings dialog. STATUS:> Connecting to "ftp.contoso.com" on port 21. FTP Voyager's login settings allow you to specify the virtual host name as part of the user credentials by using syntax like "ftp.example.com|username" or "ftp.example.com\username", but since FTP Voyager allows you to use true FTP hosts this is really a moot point. Just the same, there's nothing to stop you from disabling the HOST command for a connection and specifying an FTP virtual host as part of your username, although I'm not sure why you would want to do that. 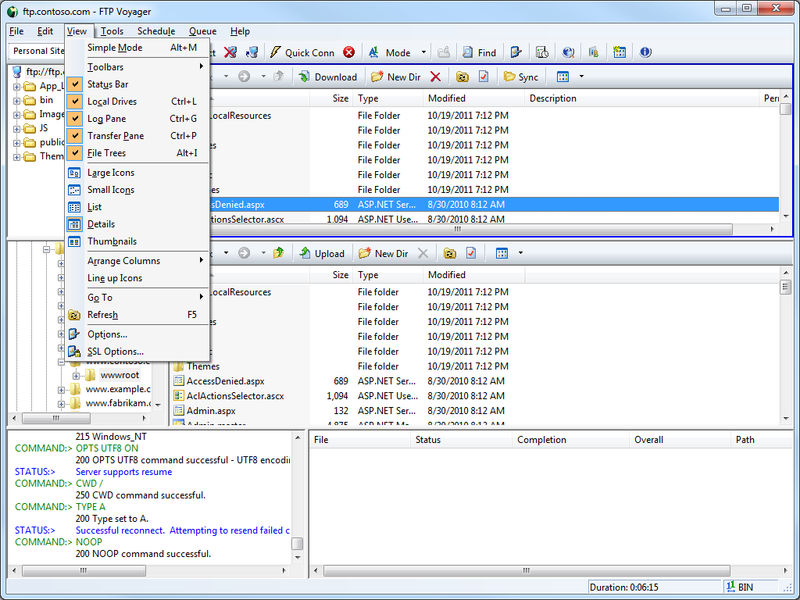 As noted earlier, FTP Voyager supports the FTP HOST command, and is enabled by default for new connections. I've mentioned in previous blog posts that I use the Windows WebDAV Redirector a lot. (And believe me, I use it a lot.) Having said that, there are a lot of registry settings that control how the Windows WebDAV Redirector operates, and I tend to tweak those settings fairly often. I documented all of those registry settings in my Using the WebDAV Redirector walkthrough, but unfortunately there isn't a built-in interface for managing the settings. With that in mind, I decided to write my own user interface. I knew that it would be pretty simple to create a basic Windows Form application that does everything, but my trouble is that I would want to share the code in a blog, and the steps create a Windows application are probably more than I would want to write in such a short space. So I decided to reach into my scripting past and create an HTML Application for Windows that configures all of the Windows WebDAV Redirector settings. 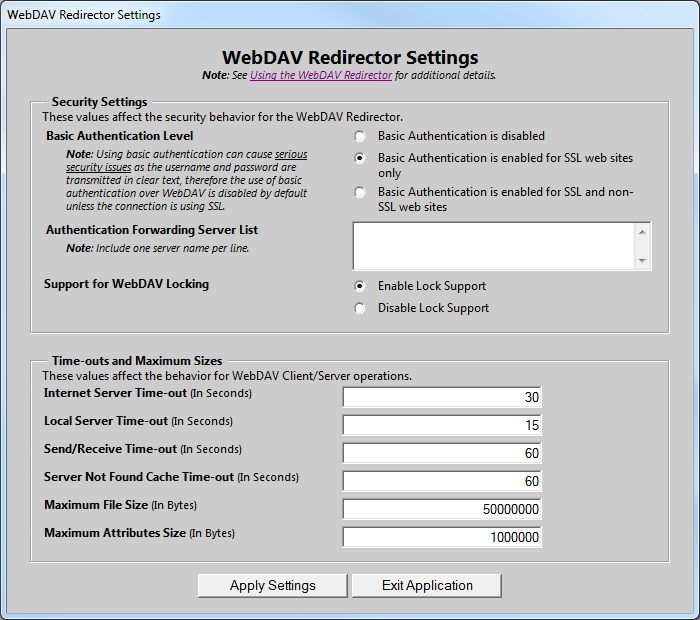 To create this HTML Application, save the following HTMLA code as "WebDAV Redirector Settings.hta" to your computer, and then double-click its icon to run the application.
' Start of main code section.
' Retrieve the current settings.
' Flag the application as having changes.
' Retrieve the settings from the registry.
' Save the settings in the registry.
' Restart the WebClient service.
' Start the WebClient service.
' Retrieve a DWORD value from the registry.
' Set a DWORD value in the registry.
' Retrieve a MULTISZ value from the registry.
' Set a MULTISZ value in the registry.
' Retrieve the value of a radio button group.
' Set the value for a radio button group.
' End of main code section. As I mentioned earlier, we had discussed the control channel is typically over port 21 for both FTP and FTPS, so you can't rely on the port. But having said that, I mentioned that you will see certain verbs in your FTP logs that will let you know when FTPS is being used, and that’s a reliable way to check.